Wednesday, March 31 is the 83rd anniversary of union organizer Cesar Chavez’s birthday. Beginning on Friday and continuing through next week, there will be commemorative events in Tucson to honor Chavez’s legacy. 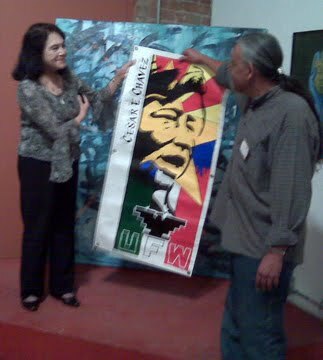 The week of celebration began last night with a reception for Dolores Huerta (above) at Raices Taller 222 Art Gallery and Workshop. In 1962, Huerta and Chavez were co-founders of the National Farm Workers Association. Together, they organized farm workers and fought for better wages and working conditions across California and the southwest. At 79, Huerta is still a fiery activist. Last night, she encouraged workers, artists, students, activists, and other progressive-thinking individuals to work together for civil rights, social justice, reform, and political power. After her short speech she urged attendees of all ages to get involved in the political process, support progressive candidates, and vote. At Huerta’s invitation, Vince Rabago, candidate for Arizona attorney general, and John Bernal, LD27 candidate for the Arizona House of Representatives, joined her on stage for brief campaign speeches. Today, Huerta will appear at the rally following the 10th Annual Cesar Chavez March, which goes from Pueblo High School to the Rudy Garcia Park on the south side of Tucson. The march, which begins at 9 a.m., goes east on 44th St. and south on 6th Ave. Click here for the parade route and more information about music and festivities at the park. If you want to learn more about Chavez, Huerta, and the farm workers’ movement, tune in to KXCI on March 31. Community radio KXCI 91.3 FM will have Cesar Chavez Day programming from 3 pm – midnight on his birthday. Huerta’s message of solidarity is particularly poignant today when immigration reform has been put on the back burner by some weak-kneed politicians, while other politicians are whipping up hatred for anyone who is different. Both Chavez and Huerta have established foundations (linked here) to continue their struggle. This article was originally published in my Progressive Examiner column. 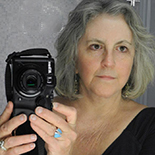 This entry was posted on March 27, 2010 by Pamela Powers Hannley in 2010 elections, Arizona, Democratic Party, Immigration, organizing, Politics, Tucson and tagged Arizona, Jobs with Justice, Tucson.